It’s great to see that The Ocean Party are keeping busy – not that they ever threatened to become lazy, but that they are choosing to continue to write and record rather than bask overlong in past successes. 2014 saw the group write and record one of my favourite records of the year in Soft Focus and I wouldn’t blame them if they wanted to sit on that for a while, as following it up would be a hard task. Soft Focus saw the group come together to create their strongest album from opening strands to closing notes. It was a huge step for the group as they signalled that they were eager to be counted amongst the countries big-time indie-rock bands. 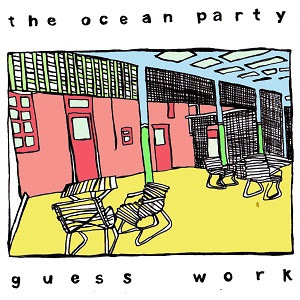 The first piece of new music for The Ocean Party since Soft Focus is ‘Guess Work’, a well constructed single that doesn’t stray from Soft Focus’ winning formula, but is a loud enough statement to make me excited at the possibility of a new record from the bunch. The song makes some poignant remarks about the state of the world and how it looks to be spiralling down the shitter. ‘Guess Work’ seems to tackle the notion of watching things fall to pieces from afar and not being happy with proceedings as such, but otherwise resigned to see everything crumble. Listen to the words in the chorus: “I want to exist outside it all, I want to watch everything fall”. For such a sunny-sounding song, it’s got a grim worldview. The Ocean Party have never shied away from talking bluntly, but up to now it’s been mostly self-referential. ‘Guess Work’ seems to look at the directionless motion inherent in living and being seemingly unable to fight the injustices. It’s a song that makes you think, and I think it’s a great addition to The Ocean Party’s discography. Hopefully they wont make us all wait for more.